Among the most exciting places that the Mars Global Surveyor's Mars Orbiter Camera has photographed during its three and a half years in orbit has been this crater in central Noachis Terra. Located at 47 deg S, 355 deg W, the crater appears to have been almost completely filled, and subsequently eroded in localized pits, by unknown processes. In this one place we see elements of the two most important results of the MOC investigation -- the discovery of young gullies formed by fluid erosion and the occurrence of thick sequences of layered rock attesting to a martian past of substantial geologic activity. Picture A shows the location of the other two figures, which are sections of three of about a dozen images acquired of this crater. Picture B shows examples of gullies on the pit walls. 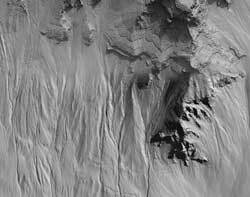 Their contributary pattern (including the angles at which they join) argues for fluid behavior during their creation; the dark floors suggest that they have been active recently (or else they, like the slopes around them and most of Mars, would be lighter-toned owing to the accumulation of dust). These gullies are formed well down on the pit wall, where a distinctive, boulder-rich layer is found. 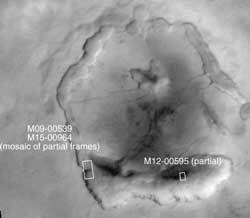 Figure C, a mosaic of two high resolution images (M09-00539 and M15-00964), shows an area somewhat higher in the sequence of layered material that fills the crater. This sequence clearly alternates between layers that either contain or erode to form boulders and layers that do not have boulders. Note in particular the overhanging layers near the top center -- such overhangs are evidence of the strength of the material. 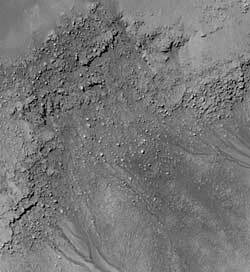 Here, too, gullies appear to start at specific layers; these, however, may not be as young as those seen in (B), as they appear to have at least a thin covering of dust. How it is that this crater came to be filled with layers of material containing (or eroding to create) boulders is a mystery.